I think you'll find this Market Club Review page more than interesting. These people really seem to have it all together when it comes to providing traders with the kind of tools which give us that edge in the markets. So whether you're into stocks and options, foreign currency spot trading or commodity futures, Market Club has some impressive tools that you really should know about. for two weeks. No credit card details will be asked for. Whatever your market preference, Market Club's SmartScan feature is truly one of the most useful tools their service offers. It is very versatile and you can set your parameters to just about any type of trading style you're into. There are just so many stocks and options on the USA, Canadian and Australian markets that trawling through them all would not only be tedious but enough to give you brain fatigue. SmartScan takes all the hard work out of it. Whether you're scanning for straddle oppportunities, slow moving stocks for range trading strategies, covered call plays, or simply upward or downward trending stocks that are priming up for a large move, SmartScan will not only provide you the list you want, but also rate them for you. SmartScan allows you the choice of 24 different scan types. To these, you add your own filters, send out the scan over the 230,000 financial instruments that MarketClub analyzes and you then receive a list of securities that match your chosen parameters. The results come with both streaming charts and a Chart Analysis Score. This score ranges from +100 which indicates a strong uptrend, to -100 indicating a strong downtrend. In addition to the scan results, you are given a range of 5 "Go Lights". If lights at least 4 out of 5 are green, a directional trade to the upside is indicated. If they're red, then you could buy put options for a trend to the downside. 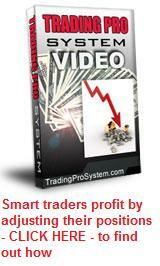 I use this information to make wise and profitable trading decisions on a regular basis. I really like it! This is one of my favourites. The results are just brilliant! As the name suggests, this feature of the Market Club membership relies on three converging signals based on a harmony between monthly, weekly and daily chart trends, using their own proprietary algorithm of weighted factors. If you plan to use the power of leverage that comes with options, futures or e-minis, the Trade Triangles could be one of your best allies. Green triangles signal an uptrend and ... you guessed it, red triangles, a downtrend. Using "daily" charts, a triangle with a little "W" inside it indicates the weekly trend is giving a signal - then you wait for another triangle of the same colour to appear on the daily chart. This confirms a continuation of the trend usually after a short contra-swing. You can filter the Trade Triangles according to your trading style. So whether you're a short or long term trader, the system will work for you. The Trade Triangles are not designed to identify reversal patterns but rather, the momentum of a swing trend. Once trends have been identified, you're then ready to enter your positions. Stay tuned and I'll show you exactly how I use this feature to select profitable trades on a regular basis. One of Market Club's most attractive features is their live streaming charts. It allows you to create custom charts according to the indicators you are familiar with. You can view the chart history, draw trend lines and add indicators; then you can save the setup so that it will always be available in future. In addition to this, the Trade Triangles also appear on the chart, giving you extra confirmation to help your trading decisions. The Streaming Charts service allows you to set up any number of watchlists of your favourite securities, apply your own custom settings and then look for confirmation for directional option strategies via the Trade Triangles. 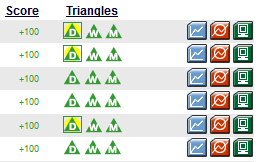 Each day, after the market has closed, I access my MarketClub account and proceed to the "Trade Triangles" button. I'm going to use this to scan the market for trending stocks because "the trend is your friend". I then choose the parameters for my scan. Let's assume I'm trading derivatives or stocks on the Australian market. I would choose "Australian Stocks" as my first parameter; "Volume Greater than 500,000" as my second parameter; "Daily Trade Triangles" as my third parameter; and "Search Since Yesterday" as my final option. If I'm trading the US markets, I would select my parameters accordingly, only with at least 1,000,000 volume as my filter. In the USA, you can't trade with CFD derivatives but you can achieve a similar thing using long dated options with a delta of at least 0.85, or futures on indexes. Then run the scan. A list of results will appear, each one including among other details, a score out of 100 and three "triangles". Take a look at this image below to see what it looks like. You'll notice that some of the "Daily" triangles are highlighted. This means they only appeared during the last trading session. I would give these preference for my next step. Sort the "Score" column into number order. I've already done that in the picture you can see to the left. If you do this after the market has closed, the results will not keep changing (changing results can be annoying). I usually have a price range for the underlying securities I want to trade. I don't bother with penny stocks, for example (but it may be your thing) so I sometimes sort the results by "Last Price". Open a chart for each security with a score either +90 or above, or -90 or below. These stocks will be strongly trending so it will be easy to run your own trendlines over the charts. Try to identify channels in the trend if you can. Decide where you think the security is in relation to the trend. Be aware of support or resistance points (horizontal lines) as well as where the current price is within the upper and lower boundaries of the trending channel. I prefer to look for breakouts, either from price consolidation, or breaking up or down from a short term counter-trend (otherwise known as swing trading). Decide where you think each security's price has the potential to go, such as the top or bottom of the channel, support, resistance, last major high, low etc. This is your exit price. Your stops should be set just above or below the most recent high or low, depending on which direction your're trading. Make a shortlist of securities you plan to trade at the opening of the next market session. Decide on your investment amount per trade according to your money management system, then place your trade with confidence. I have used the above simple system to double the balance in one of my trading accounts in just two months. Once you become a member, you will find a section called the "Trade School". This contains a wealth of information to educate traders in both basic and advanced trading concepts. Most of this comes in video format which can be downloaded and watched at your leisure, or study books in Acrobat .pdf format. Some of the top trading experts in their respective market fields have contributed toward the production of this information. The value of these seminars alone more than compensates the cost of your membership. But if you want more up to date information and real time discussions about what is currently happening in the market, the MarketClub stock and forex traders blog might be the place for you. For example, if you're an index options trader, discussions and commentaries about the future direction of the market as a whole might be of real value to you. Part of my Market Club membership includes access to the Traders Blog where you get a Market Club review of the markets daily. One feature of the blog includes MarketClub TV - video presentations and educational seminars from top traders and market commentators, including recommendations and 'stocks to watch' etc. If you're really into the markets, this is one place where you can enjoy that sense of community with other traders. The final feature we wish to mention is market alerts. You can set a price alert for any stock, index, future, or forex pair that you want and a notification will be sent to your mobile phone or email address. Now here's an alert scenario which encompasses all the MarketClub tools. You use SmartScan to shortlist a group of stocks that meet your criteria. 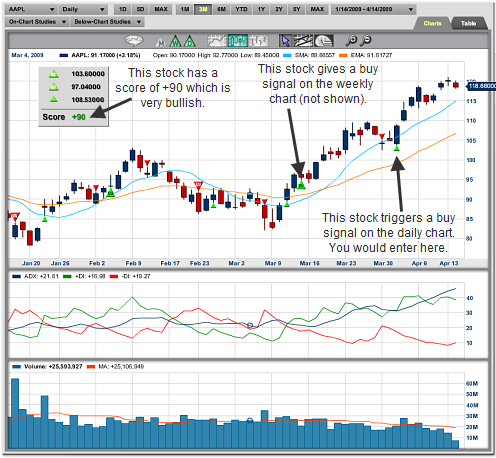 You then check the Chart Analysis Score for a particular stock and find it ranks at +70. Looking at the chart you can see that if it breaks above a certain point then the rank will rise above +80 and trigger a signal to go long (buy) call options. So let's say you set your alert for a price above $47.10. The alert is sent, you buy long dated calls (or a debit spread) on the back of a reverse head and shoulder pattern with an expected price peaking out at $67. Alternatively, you can add a number of securities (e.g. Dow 30, forex pairs) to your own private "portfolio" and set daily alerts for their current "trade triangle" status. Now you will receive a daily report by email. Quickly scan the report then go to the streaming charts service and view the ones that take your interest. Success in the markets is all about having the right tools! Test Drive MarketClub Today free two week trial!